I am heading off for our 4th field season at the site of Çatalhöyük in Turkey today, so it seems like a good time for an update. The report on our last season (2011) was published a few months ago as part of the annual Çatalhöyük Research Project Archive Reports; if you scroll down the document to page 110, you’ll find our contribution. This year should mark the point where we’ll have a sufficient amount of rigorous qualitative data (collected since 2009) to allow scholarly publication of our findings. We are heading over to the site with four Southampton undergraduates, and we’ll be meeting a Turkish student from Ege University who will be collaborating with our team. I’ll keep you posted on our work. 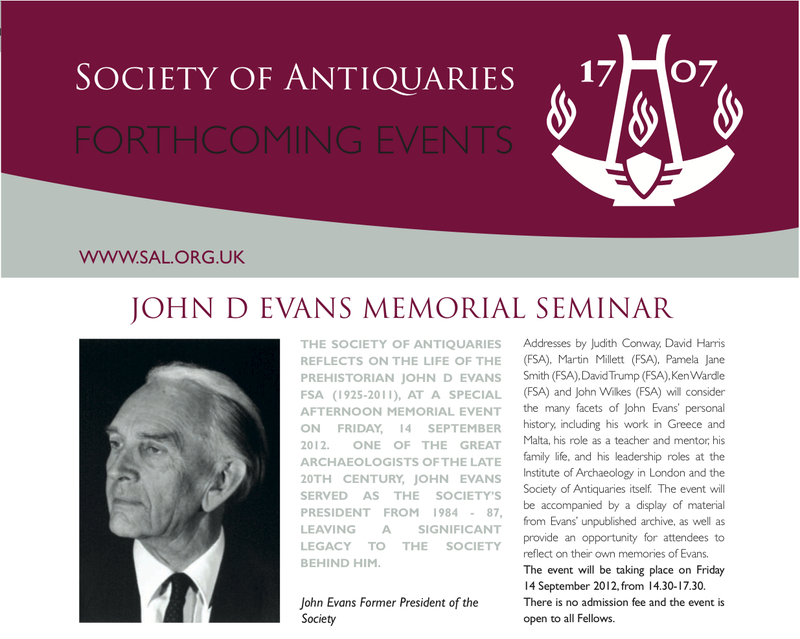 Otherwise, it’s been a very busy summer, not least because I am organising an event on behalf of the Society of Antiquaries of London in memory of the late John D. Evans (1925-2011). Evans occupied a series of key posts over the course of his archaeological career, including Director of London’s Institute of Archaeology (IoA), and President of the Prehistoric Society, the Council for British Archaeology and the Society of Antiquaries itself. Organising the event has been an interesting experience both because it’s given me an opportunity to connect with world-renowned researchers in pursuit of potential speakers/contributors, and because it has helped to illuminate how a scholar who once held so many influential roles in the UK archaeological world could simultaneously seem so elusive, with a life story that has generally gone untold. Evans’ personal archive has recently been donated by his family to the IoA, and review of its contents by Prof Todd Whitelaw (see his blog post for the Day of Archaeology) and Dr Amara Thornton is helping to articulate the dimensions of his story. The free memorial event is set for Friday, 14 September, 2012 from 14.30-17.30 at the Society. It’s open to all Fellows, but if you aren’t a Fellow and have a special interest in Evans’ life, please get in touch with me (my email address is available here). Short addresses by Judith Conway, David Harris (FSA), Martin Millett (FSA), Pamela Jane Smith (FSA), David Trump (FSA), Ken Wardle (FSA) and John Wilkes (FSA) will consider the many facets of Evans’ personal history, including his work in Greece and Malta, his role as a teacher and mentor, his family life, and his various leadership roles. The event will be accompanied by a display of material from Evans’ unpublished archive put together by Amara and myself, with assistance from Todd. Below is the advert that’s been circulated to Fellows. In addition to this, and writing articles, and planning my modules for next year, and supervising my 12 outstanding dissertation students, and taking over a new admin role in the department related to media & outreach, and departing for Çatalhöyük, I have tried to find some time for holidays this past month. Unfortunately, the nature of my job is such that real vacation time seems impossible at this point in my career. Commitments and emails constantly loom large, and I have yet to figure out how anyone can take more than 2 days away without sacrificing an important deadline or related responsibility. I suppose Çatalhöyük will provide the ultimate test as to whether time away from the computer is feasible, for email access is so sporadic and unstable there. We’ll see. I have other good news, as I’ve won an internal grant at York to facilitate a research trip to the British School at Rome (BSR) in September. The trip is geared towards scoping out a potential collaboration between myself, the BSR, my colleagues at the University of Southampton (Prof Simon Keay and Dr Graeme Earl), and my colleagues at the Archaeology Data Service. I’ll look forward to updating you on that too. Next postWho exactly is a ‘real’ archaeologist?